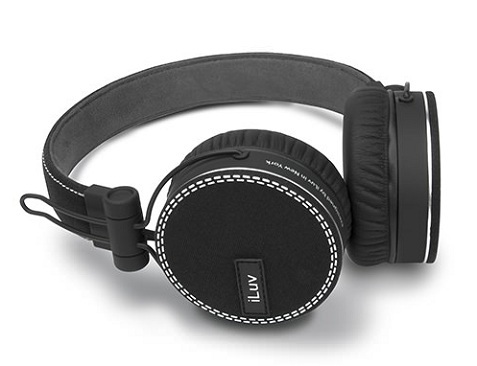 We tried out these stylish new ReF headphones from iLuv and were very impressed. We love the styling and the white stitching, and along with the black version picture above the headphones also come in red, white and blue. Check out their website for a look at the other colors. If you’re looking for a last-minute holiday gift you can’t go wrong with these headphones. The styling make these headphones a great option for anyone, as they’ll fit into an urban setting or even a more professional setting with the slick but classy design. While styling is important, we’re happy to report that the sound quality is excellent and the headphones are very comfortable. Other impressive features include the braided fabric 1.2 meter cord, Titanium diaphragm for mega-bass and precise treble, in-line remote with play/pause, volume, and track change controls and built-in mic with hands-free. The earphones are also collapsible for ultra-portability.